I love a good flat shoe. Not surprising, considering that I’m pushing 5’11”. Add on any extra inches and I unfurl upwards to well over six feet. Sometimes there’s a kind of satisfaction in heels lifting me to tallest girl in the room – leaning my elbow on friends’ shoulders and generally being a little obnoxious about towering above half the boys. Plus, heels make legs look good (well, as we’re constantly told by various magazines trying to convince us of their use). There are a few people out there who I marvel at for their ability to saunter around in stilettoes without any visible effort. Maybe their feet are made of stronger stuff? Either that, or they’re better at hiding the pain/ remembering to keep gel cushions in their clutches to soften the aches. And yes, heels can be glamorous or elegant or powerful or intimidating or gut-punchingly gorgeous. However it seems that, to use some abysmal ‘fash-speak’, flats are having a moment. At the last LFW, many designers showcased outfits accompanied by sandals, trainers and lace-ups – the models not strutting, but strolling. To those of us who make our sartorial choices independent of what the industry deems on-trend (i.e., I suspect, most of us) this may be a case of “so what? I’ve been doing this for years.” But it’s interesting that functional footwear is being seen as important enough for plenty of brands to be promoting it. It seems to be something of a growing movement too. Hannah Rochell’s recent book ‘En Brogue: Love Shoes. Love Fashion. Hate Heels’ (the title taken from her fabulous blog) is something of an ode to all things flat. A playful publication, it’s full of delicious information and illustrations. I remember being in my last year at secondary school, sick of the ballet pumps worn by all my female peers. I decided that the way forward was brogues. However, although now ubiquitous in every shop you you pop into, at that point they were much harder to source. All I could find were flimsy, thin-soled shoes playing at being brogues. So I switched tack and began scouring the men’s section in charity shops. Eventually I found a pair of St Michael shiny size 6.5 black brogues – made of stiff, dependable leather. I wore them until they fell apart. I’ve continued the tradition since by buying plenty more pairs of brogues and loafers for men (I swear they’re usually better constructed), although I do have a deficit of flat shoes that can be worn for evenings out. (Instead I usually end up pairing my lace dresses with Chelsea boots). But it means I can remain later and dance longer, unhampered by pinched toes or sore heels. To me, as much as the aesthetic of a heel appeals, flats are ultimately more liberating – and I want clothes that allow me to feel confident, to stride around and to embody the space that I’m in. 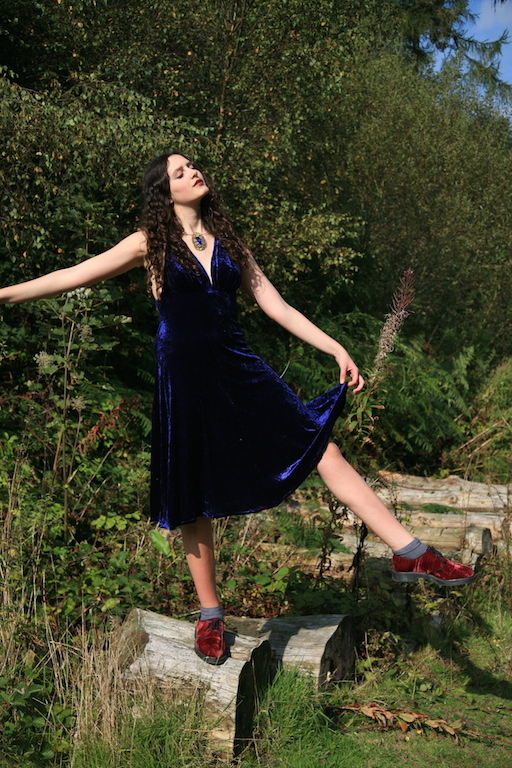 Here I'm wearing some rather glorious second hand velvet DMs my mum found on eBay for £15. She's an online shopping marvel (with great taste). I've worn them a lot this term at uni. To complete the look of all-things-tactile, I'm wearing a dress bought from the bargain section of one of my favourite Oxford vintage shops - Reign. It was £8, and has since seen many a trip out for cocktails, dancing, and, at the end of last term, punting along the river in the sunshine. Photos taken mid September. Such an engaging post, as per usual! I completely agree with you, although as I'm only 5'2" I don't quite have the advantage you do of being tall regardless. Lovely outfit too, I have some similar purple velvet desert boots! The jewel tones all around are so beautiful. I suspect that the trend toward flats is fueled, at least in part, by demographics - we're becoming an aged society and more and more women need stylish alternatives to heels. But hurrah! It's a win-win situation for everyone. For one reason I always love to see tall girls wearing heels and those not tall wearing flats...just to prove wrong all those articles on how to look taller or shorter...I find it funny they have them for every kind of body type and height. No matter what body type you are, you must try to look like someone else. I've read a few of them and on the section for tall they always have advice how not to look tall and vice versa. Why someone just couldn't feel fine being skinny or curvy or tall or not or whatever? There is always this implication we must look different no matter what the cost. I did notice that in my region girls stop growing after 185 at least they won't admit to it...if they're taller than (and closer to 190 cm or more) they will always say I'm 185. It must be some kind of magic number like woman saying they are 38 years old and not admitting a year more for at least a decade...or so some joke and urban myth said. Still, most of them rock heels and I think it is fabulous to see a 190 cm woman in heels. One athlete from my city took a photo with Klitcho and she was taller than him (in heels)... I thought it was really amusing! Nevertheless, I really like this flats and low heel trend...I think that the idea that one must wear high heels to look good is silly and I'm glad people are starting to realize that. Yes, yes, yes! Amen. I love the aesthetic of heels, but they're god-awful things to wear. Plus, at 180cm, I'm tall enough. You're right, there is definitely some satisfaction in having so much height; I tend to get a little obnoxious too. The men's shoe section is actually one of the first places I go to in charity shops! Love those DMs and that dress is stunning - you look amazing. Also, great posts on imagined conversations, second hand, and your grandmother - she sounds MARVELLOUS! Adore your outfit in the post below (SHEER SLEEVES! METALLIC MINI DRESS! THOSE SHOES). Have bookmarked that piece so that I can come back and search those musicians, as we seem to have similar taste in music (I love Nick Drake too). P.S. I think you look SO much like your mum in that second photo! Oh I'm totally with you on this one! I'm exactly the same height as you and whilst it is a novelty to be 6'2 in heels, sometimes it's just a bit excessive. Your mum is quite the bargain hunter 0 I love these! I love the aesthetic of heels, but unfortunately I'm completely incapable of wearing them, for whichever reason they hurt my feet and ankles almost immediately. However I tend not to care too much as I do love my flats! It's never occurred to me to browse the mens shoe department before, but being a size 5 I guess I'm unlikely to ever find anything running that small, but what a great tip. 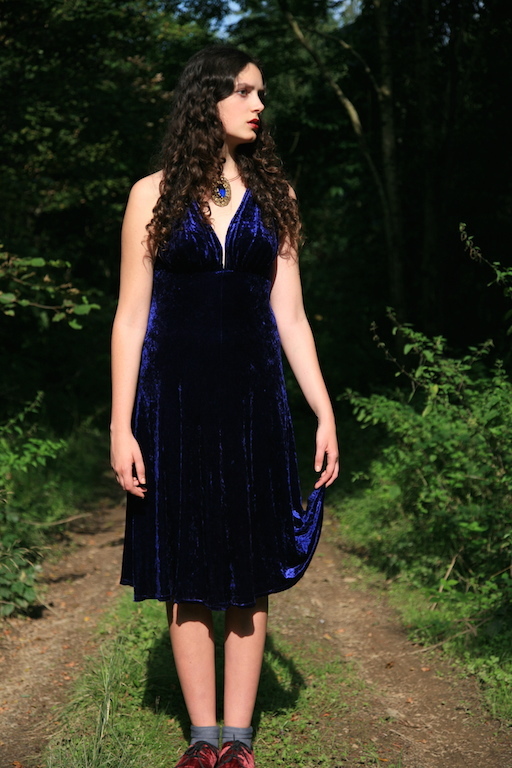 I just love this outfit with the jewel tones and double velvet. DMs, whilst wonderful, generally aren't a shoe described as elegant but you've achieved it beautifully! Love the velvet Docs... what a great find! I never really wear heels other than on a night out and then I'm always the one moaning about my feet and needing a piggy-back ride home (so elegant!). I do adore flats, but I also love heels, I am only 5'9" so, I guess both styles are worn quite a lot depending on where I am going or my outfit. I do love wedges though. Although, these days I choose comfort mostly since I am always on the go! 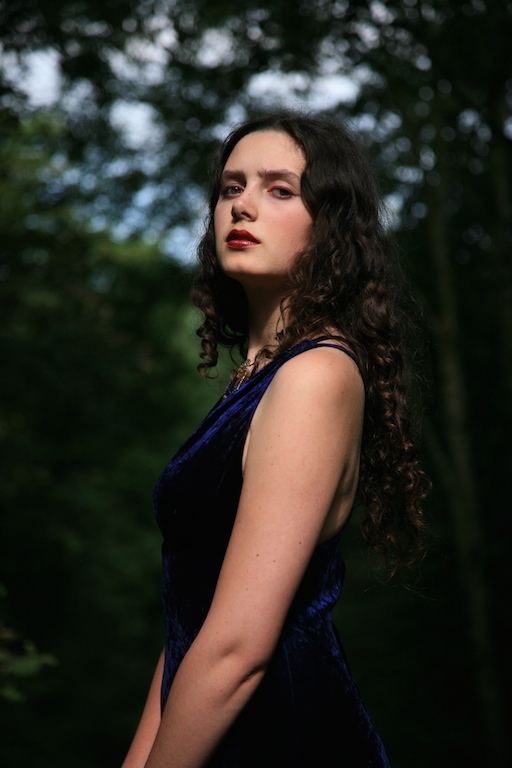 You look beautiful and regal in velvet. Marvellous secondhand buys!